Three seminars – at CERN, at Gran Sasso and in Japan – and an article calling for the scrutiny of the scientific community: the OPERA Collaboration opened its research publicly. In addition to huge press coverage, this triggered welcome reactions from colleagues around the world, many of whom will attempt to independently interpret and reproduce the measurement. OPERA’s Spokesperson touches base with the Bulletin. 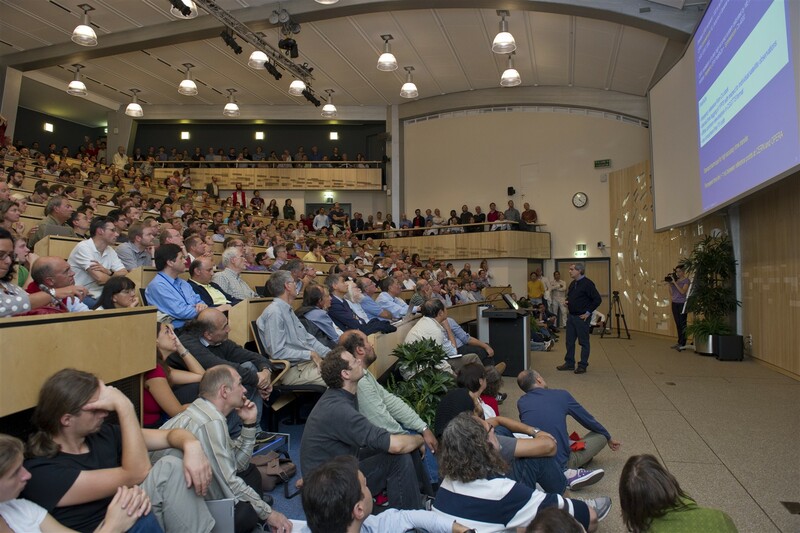 The CERN Main Auditorium was crowded as OPERA Physics co-ordinator Dario Autiero presented the results of their research (23 September 2011). So far, the main reactions have focused on the Earth’s rotational effects, subtle general relativity issues, the technology used to measure time and distance, and the analysis methods. “After carefully considering all these points, we still have no indication of any large systematic effect that we could have overlooked. However, we are just at the beginning of the screening process by the community and we will have to wait longer,” says Ereditato. Borexino is installed in the same LNGS underground hall (Hall C), about 20 metres upstream of the OPERA experiment with respect to the neutrino flight direction from CERN. The volume of the Borexino detector is larger than that of OPERA, and Borexino is able to collect a larger number of events produced by CERN neutrinos. The main goal of the Borexino experiment is the study of solar neutrinos and geoneutrinos. At present, the experiment is not equipped with the special timing devices required to measure the neutrino time-of-flight from CERN with the accuracy required to cross-check the OPERA results, which would be possible only by installing new timing devices. After preliminary discussions, the Borexino Collaboration has expressed interest in performing an independent measurement to cross-check the result from OPERA. However, the discussion has barely started and is still ongoing. A decision has not been yet been made. In an optimistic scenario, the Collaboration could be in a position to collect data by the start of the beam run in February 2012, but this depends on the successful implementation of necessary improvements, which cannot be fully evaluated at this time. The LVD Collaboration has a great interest in the issue raised by the recent OPERA measurement. The experiment, designed to detect gravitational stellar collapses, can also detect neutrinos from the CERN beam. However, the Collaboration has to evaluate carefully if it can contribute a significant result with their detector as it is, or if it has to change, modify or add some detector parts. Based on an initial assessment of the experiment’s current capability, T2K cannot make any definitive statement to verify the OPERA measurement of the speed of neutrino. The Collaboration will assess the possibility of improving their experimental sensitivity in order to cross-check the OPERA anomaly in the future. Such a measurement with an improved system, however, could take a while to achieve. The MINOS Collaboration is planning to improve its measurement of the neutrino time-of-flight since its last result in 2007, with better-controlled systematics and about 10 times more data. The first update should be in about 6 months. There will be a further improvement (which was already planned) for the MINOS+ experiment, starting in 2013, which will take very high statistics, and higher energy data. This should give a total error of 5-10 ns on the final measurement.